You are here: Home » A Journey Worth Starting | Introducing Amy Koons to the Blog! A Journey Worth Starting | Introducing Amy Koons to the Blog! Hi, I’m Amy Koons. 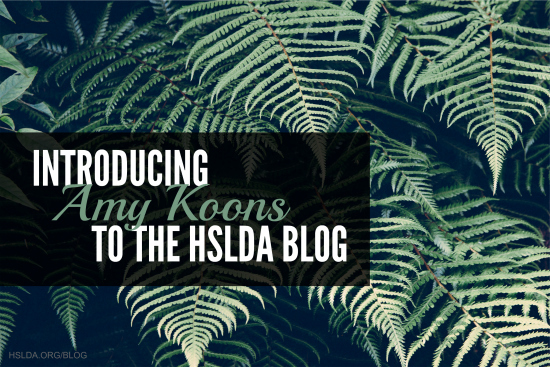 It’s great to join the HSLDA blogging community! I look forward to posting here and hopefully hearing back from many of you as we share in the rewarding, and definitely never dull, experience of homeschooling our children. My parents stuck with homeschooling, despite my initial protests, and homeschooled all of their five children through high school. Now I live in the Midwest with my husband and our own four children. I met my husband Kevin, also a second-generation homeschooler, while working at HSLDA. I have a law degree from Oak Brook College and worked in public policy prior to homeschooling our children. It’s an interesting study in contrast to think about my life working in public policy versus my current life, homeschooling four little kids. My life now is crazy, loud, full, and when I have time to stop and think about it, a wonderful life. Our children are ages nine, seven, five and two. The biggest challenge I have faced so far is wearing so many hats all at once and trying to be a mom and teacher to children in very different phases of childhood, with different needs. The other day I bought my youngest child’s first potty training pull-ups and my oldest child’s first training bra, in the same shopping trip!! Can I just say that I was a little overwhelmed that day? I have also learned that homeschooling a 4th grader and 2nd grader, with a preschooler and wannabe Evil Knievel toddler underfoot, is not a job for the faint of heart. There are many moments that bring me to my knees. Those are the moments that cause me to reevaluate my priorities and remember the reasons why we chose to homeschool in the first place. My biggest joy in homeschooling is having more opportunities to connect with my children and hearing them express their thoughts about important matters, and watching them grow into understanding. These moments, which usually happen during the toddler’s nap, are infinitely rewarding. They are the moments that help me keep perspective. Ultimately I know that I won’t regret spending the most time possible with my kids and doing my best to instill in them our family’s values and a love for learning. When I mess up, I just pray that God’s grace will cover that! Thanks for reading. And thanks for joining the journey with me.